June 29th 2014. Hello from Mamfe! We arrived here Sunday afternoon after a long, adventurous trip from Ngaoundere. We took the overnight train on Friday from Ngaoundere and arrived in Yaounde on Saturday morning. Then, we took a bus from Yaounde to Bafousam, then another bus from Bafousam to Dschung where we stayed the night Saturday night. Sunday morning we woke up and took another bus from Dschung to Bamenda, and then a private car from Bamenda to Mamfe. What an experience! I couldn’t believe how many people can fit into those busses! Mamfe is HOT and HUMID. I dont know that we’ve ever sweated so much in one week, but not even this sort of heat could slow us down. We hit the ground running on Monday to begin UAC’s third year of CAC training. There were about fifteen participating coaches at the beginning of the week, including several returning coaches from UAC. By the end of the week we had closer to 25 coaches, both male and female. 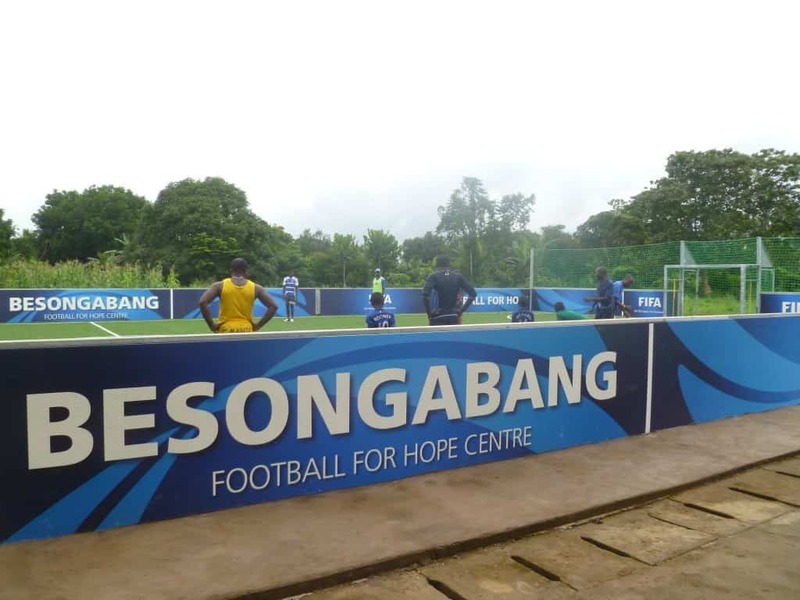 Our trainings were hosted at Mamfe’s brand new FIFA Football for Hope center. We found out shortly after arriving that our CAC training would be the first event ever held at the center. It is a really beautiful facility, equiped with a classroom, a computer room, and an office next to the football field. 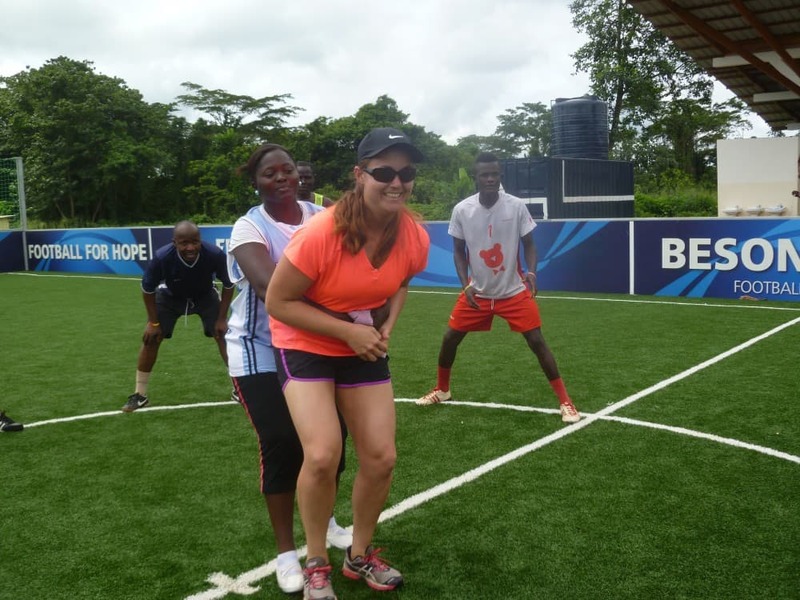 Wallace, a Community Impact Coach from CFDP in Kumba, joined us in leading our Coaches Across Continents training. He did a great job of leading and coaching games and was great company to us this week. We are looking forward to seeing him in a week when we head to Kumba for CFDP’s training from June 23-27. It was fun to lead CAC program in it’s third year. For this week, we focused on environment care, HIV, child protection and gender equality. The HIV games were a huge hit with this group. These games brought out a lot of laughs and a lot of great discussions. There is a game we played called Adebayor In The Community that the coaches really enjoyed. This game represents how quickly HIV can spread and also how making good choices like getting tested for instance, can protect you from contracting the virus. The coaches that participated in our child rights training session Wednesday morning brought a spark to the discussions that carried us through the rest of the week. The new addition to the CAC curriculum was a great opportunity for coaches, teachers, and volunteers alike to discuss, openly and honestly, some of the ways in which children in Mamfe are marginalized. We talked about how sometimes children are expected to work for their families and that those responsibilities are engrained in cultural expectations but can impede on that child’s right to play. We discussed the possibility and importance of not ignoring thst cultural norm but working within it, within reason. If a child is expected to perform chores or work for their household, some of the coaches stressed that it is important that they support these roles at home but thst they intervene if these chores become problematic for that child’s social development. It was great to hear coaches talking about how to tactfully and respectfully interact with parents and work to resolve the issue so that the child can enjoy the benefits of play and contribute to his/her household. Another fun thing to make mention of is that the World Cup started this week! We had the opportunuty to watch it with some of the coaches here in Mamfe on Thursday and Friday night at a nearby restaurant that played the game on a big projector screen. The power went out just before the opening game on Thursday, but thankfully the restaurant was able to find a generator quickly so that we didnt miss more than the first few minutes. Cameroonians sure love their soccer!